The only award shows I pay attention to are music award shows, however, TV and movie award shoes tend to garner my favorite fashion choices, which is why I always check out the red carpet photos from the events! Last night was the 2016 Golden Globe awards and let me just say, it was tough to pick my favorite looks! I don't think anybody looked anything less than lovely, but I was able to pick some of my favorites from the bunch! 1. Olivia Palermo in Delpozo. She is just a vision, all around. Look at how sweet she looks! I am always a fan of Delpozo's silhouettes and color palettes and OP rocks them with elegance. 2. Rooney Mara in Alexander McQueen. I think Rooney's skin tone with this color fabric is absolutely gorgeous, especially with her sleek undo and the brick red lip. 3. Saoirse Ronan in Yves Saint Laurent Couture by Hedi Slimane. Saoirse looks like an absolute goddess in this white gown with it's draping and train. I love, I love, I love. 4. Jena Dewan-Tatum in Zuhair Murad. I remember drooling over this collection in the first place and to see it off the runway just makes my heart soar. 5. Lily James in Marchesa. Yet another look that just screams "goddess" to me. I love the high neckline with it's cutouts and the dimension at the bottom of the dress. And her hair? Tousled to perfection! 6. Zendaya in Marchesa. Marchesa was on a roll last night. I've never seen Zendaya in a red carpet look that I haven't liked, if I'm being honest. She always looks killer and she is one of the few people who can make this tiered skirt look incredible. 7. Taraji P. Henson in Stella McCartney. I am absolutely speechless. Have you even seen a dress flow so fabulously on anybody? I don't think so. Taraji is a vision in white and I don't know if I'm ever going to be able to look away from the screen, to be honest. 8. Emmy Rossum in Armani Privé. Once again, look at how well this dress fits her. I just...I literally can't. That bright blue toned red is so flattering on Emmy and her necklace is the perfect accessory for that neckline. 9. 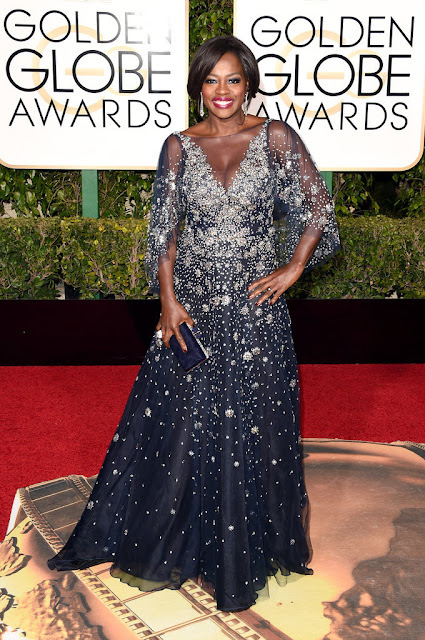 Viola Davis in Marchesa. Viola looks like the absolute start she is. That deep navy really compliments her skin tone and she just looks radiant in this sparkly gown. 10. Brie Larson in Calvin Klein. Talk about bada$$. Something about this dress makes it look a bit like armor, but fashionable armor. I am in love with the glitz and glam of it with the combination of a more masculine top and halter neck. What was your favorite look from the red carpet last night?